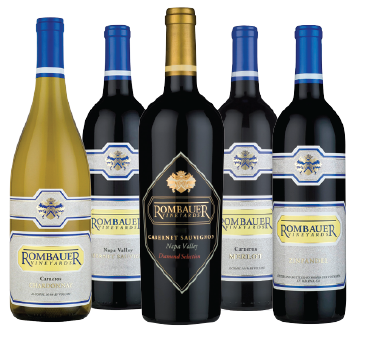 Rombauer Vineyards was established in 1980, when the Rombauer family harvested their first grapes — Cabernet Sauvignon from Napa Valley’s Stags Leap District. Nearly 35 years later, the winery remains family owned and operated with members of the first and second generations involved in all aspects of the business. When founders Koerner and Joan Rombauer moved their two children, two horses and five dogs to Napa Valley in 1972, they had no intention of starting a winery. They chose the area because it reminded them of the small-town, agricultural environment in which they had grown up, and it appeared to be a clean, safe place to raise their children. They purchased 40 acres of beautiful hilltop land on the Silverado Trail near the town of St. Helena in California. The Rombauers did have a great appreciation for the role of wine in the fine dining experience. Koerner’s great aunt Irma Rombauer was the author of the internationally renowned cookbook The Joy of Cooking and Koerner’s ancestors were from the winegrowing region of Rheingau, Germany, where wine is considered an essential complement to a meal. It didn’t take long for Koerner and Joan to become fascinated with the growing Napa Valley wine industry. In 1976, they became partners in Conn Creek Winery. Koerner learned the wine business first in the cellar, working hand in hand with the winemaker and learning all phases of winery operations. In 1980, the Rombauers made their first wines under their own label at a neighbor’s winery. In 1981, they sold their interest in Conn Creek Winery and began construction of the Rombauer Vineyards winery on the property adjacent to their home. Today, under the direction of Director of Winemaking and Viticulture Richie Allen, Rombauer Vineyards combines traditional viticultural and winemaking practices with the best available technology to ensure the highest quality wine production. The winery produces award-winning Chardonnay, Cabernet Sauvignon, Merlot and Zinfandel. Contact your local WineStyles to reserve your seat! This entry was posted in Winery Spotlight Tastings and tagged Cabernet, California wine tasting, local wine event, local wine tasting, merlot, napa valley wines, napa wines, Rombauer, Rombauer winery, tasting, tasting event, tasting station, wine, wine event, wine portfolio tasting, wine tasting, winery spotlight, winestyles, zinfandel. Bookmark the permalink.